Hey, did anyone miss me? Sorry I haven't been able to post anything in the last 10 days or so, but I've been working a lot, sleeping very little and eating very, very quickly. Well I guess working from home and being a mom at the same time is not always the happiest combination in the world. But I'm trying to survive. What happens in periods like this is a lot of quick dinners, usually put together with few ingredients I can find in an almost empty fridge, because even grocery shopping is a mission impossible. I'm taking just a short break from work to write this post, and then I'll go back to my translation - can't get away from my computer, can I? 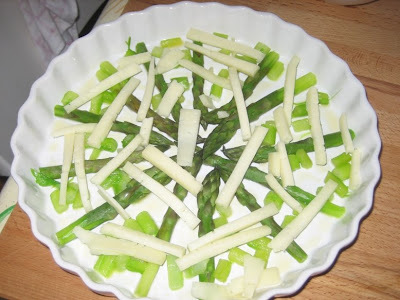 Wash the asparagus and peel the tougher outer skins. Boil them shortly till al dente. 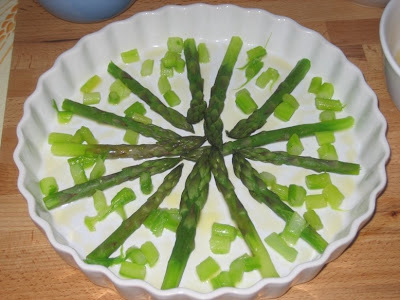 Place drained and dried asparagus in a slightly buttered oven pan with the tips facing the centre. Since they were too long for my 25 cm (11") tart pan, I shortened them and then chopped and distributed the pieces between the whole ones. Put a few pieces of butter over the tips. Add ham cut in stripes and sliced Fontina cheese. and bake for 10 minutes in a very hot oven (around 220°C) just until the eggs are set and the cheese starts melting. 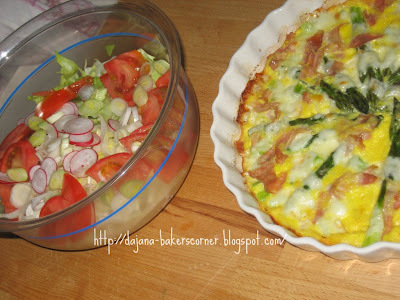 I served this "frittata" with a mixed salad. 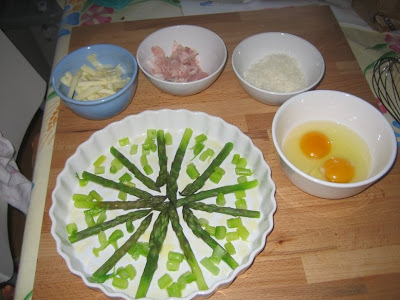 Lessate gli asparagi tenendoli molto al dente, sgocciolateli ed asciugateli. Disponeteli in una pirofila leggermente imburrata con le punte verso il centro. 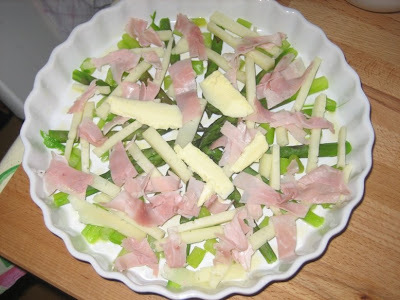 Sopra la parte tenera distribuite qualche pezzetto di burro, il prosciutto a striscioline e fettine sottili di fontina. Versate poi le uova sbattute, salate e insaporite con un po' di formaggio grattugiato. Cuocete nel forno riscaldato a 220°C circa per 10 minuti. Operite šparoge, ogulite donji dio stapki, i kratko prokuhajte, ali da ostanu dosta čvrste. Ocijedite i osušite kuhinjskim papirom. Rasporedite šparoge u namaštenu vatrostalnu posudu tako da vrhovi budu okrenuti prema sredini. Rasporedite nekoliko komadića maslaca na mekane vrhove, pa preko njih stavite narezanu šunku i sir. Umutite lagano jaja, malo posolite i pomiješajte s naribanim parmezanom. Prelijte preko šparoga, sira i šunke. Pecite u pećnici zagrijanoj na 220°C oko 10 minuta. 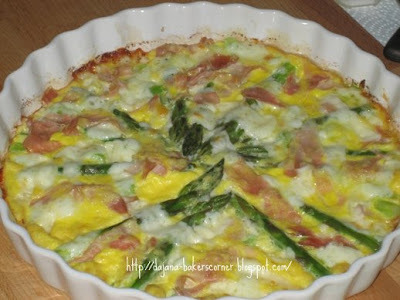 Your frittata's and tarts are always so pretty! Less sleep, more work, and faster dine.......hm......much like my life before. 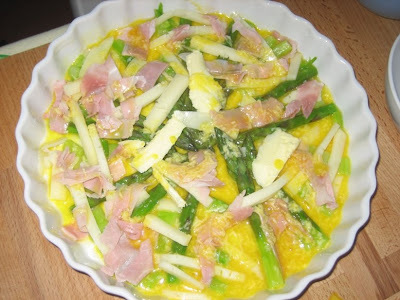 Asparagus Quiche....my mother-in-law made this for us with white asparagus. All this and still you take the time to arrange your dish so artfully!! This sounds delicious...give yourself some "me" time!!! Fortunately it's not always like this, but working freelance I need to accept work when I have an opportunity. And I'm taking a week vacation starting on Friday. Yay! I haven't had lunch yet and now I want THIS!!! guess I won't be finding it at my local sandwich shop :(. It looks really good and sooo pretty! Delicious comfort food!! Have a great vacation! !